This morning I was searching on line to find an article about “Saino-Kyoiku Tone” by Clifford Cook. Instead, I stumbled upon my friend Eric Madsen’s Thesis! Eric attended Dr. Suzuki’s school during my years there and he was an excellent student! This reading is very spiritual and VERY enlightening for all who seek a spiritual path. Especially starting on page 112, parents, students and teachers will find some very clear explanations for the ways of Suzuki method!! However, if you have time, the entire thesis is absolutely priceless! Well done Eric! ありがとう ね ^-^ ! Here is the link! Enjoy! Dr. Suzuki was quintessentially kind. His method of kindness was much deeper than his consistent smiles or greetings. His kindness stemmed from sensitive observation and thorough understanding of a person’s true, specific, long term needs and desires. He was selfless, ingenious and magical. 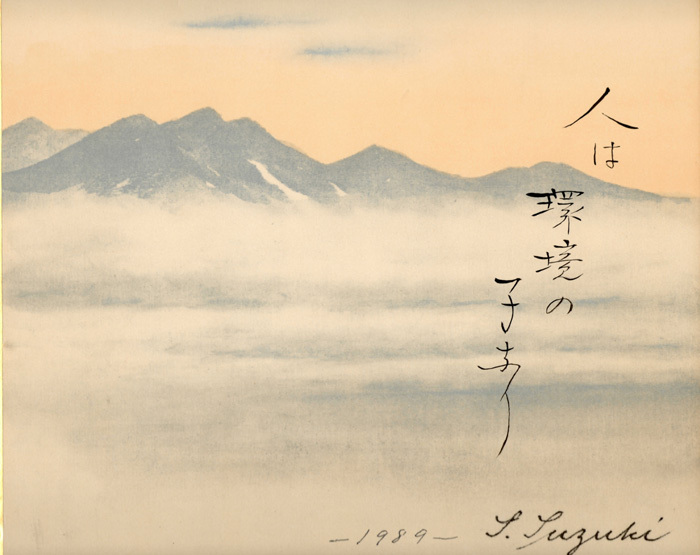 Dr. Suzuki gave to us in unusual, wise and unexpected ways. His methods involved projects engaging several people. These projects, seen as spontaneous were actually the result of weeks, months, years, and even decades of delicate, persistent planning and hard work. His kindness to all of us encompassed everything! You name it; he helped us with it, from taking us out to steak dinner to privately curing a student’s deepest wounds. The only thing I know that engenders this form of true kindness is an absolute pure spirit of love. Suzuki Sensei‘s greatest genius of love lay in his ability to put into “Perpetual Motion” a long sequence of seemingly unrelated events occupying several people (knowingly or not). The results of these sequences would eventually create a deep, personal service causing a fantastic change for many different and specific people around the globe. continuing his legacy of kind and selfless love. I believe with all my heart that today we are fulfilling Dr. Suzuki’s most cherished and fervent wish. How clever and magical will we be? How far will we extend his true spirit of service? To what lengths will we shine? This has been my shikishi forever. Every time I received a painting from Dr. Suzuki, it said that phrase out of the hundreds of quotes that he made, this was always mine. “Repetition is important!” as we all know from working with these amazing, loving children. with a NEW saying. Only at this very moment is the full import of this hitting me as I am in tears. With mountains in the background and a lovely tree… the tree of life. And so this morning as I pondered… (as I am wont to do in the early morning time) I remembered… I remembered my first concerts in the huge auditoriums wearing my scratchy petticoats and stiff satin dress, patent black leather shoes and dangling my feet on the nice cushy chair while watching and listening to beautiful music. We listened. We watched beautiful ballets, orchestral performances – almost any cultural event meant that we would be in attendance. I remember my very first Nutcracker performance. I remember hearing and watching Issac Stern perform at the Capitol Theatre as I sat in the mezzanine and studied him closely. I remember making the audio tape of Twinkle, Twinkle Little Star to send to my Grandmother and Grandfather so far away, and later, i remember playing Bach Adagio for him in the Jackson Lake Lodge …. at his request, his only request as an exchange for the beautiful Vaillaut Violin that I now own. I remember. I remember. When I was 5, my Mother was getting her Master’s degree in Piano. I used to color quietly (I hope) in a corner and listen to even more beautiful music. (Hito ha kankyou no ko nari) I thought all Mommy’s in the world when to school and sang in the Hallelujah Chorus. When I was 17 and Graduated from Realms High School, there was never any question about what I would do upon Graduation. 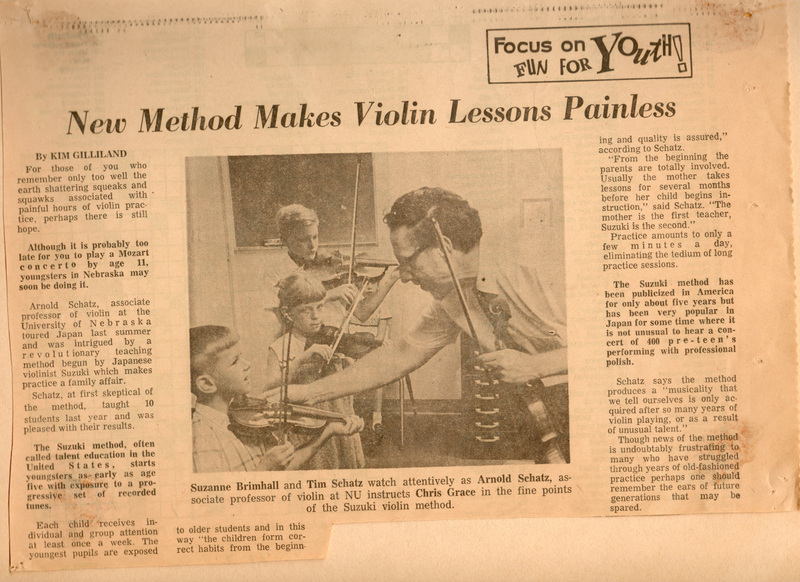 It was fervent desire to continue to study the violin at Graduate levels. and it has just never stopped. My Mom ran the Institute here for 15 years where I began to not only teach, but to study HOW to teach. And later I had so many opportunities to rehearse and perform with amazing symphonies. Even a few days ago, there was my Father with his camera and my Mother my video camera, videoing not only my Students, but my Grandstudents (students of my older students) during their recital as I held my precious violin (A gift from Grandparents, my Mother and my Father, please bless his heart 100,000 times for kindly listening to my early squeaks and squawks). She needed to video them because I needed to hold the violin “just in case” any one student needed a note prompt. Just in case – to pave the way for their success as Beth Titterington taught me so long,long ago 😉 Or sometimes I simply walked to the very back of the auditorium as Suzuki Sensei often did, and I “Air Bowed” with them for spiritual support. And so, back to the fact that we are ALL children of our environments. Suzuki Sensei has given us a gift. You see, my Parents and Grandparents love me SO MUCH. They gave me the gift of music! My Mother paved the way for my success. For life. For the Present. And then, they let me go to Japan at a very young age for a very long time. They let me grow. And grow. And we all continue to study. And now, at more than twice the age that I was when I first went to Japan, I am only just now beginning to understand the importance of the prophetic words of Suzuki Sensei…”Hito wa Kankyou no ko nari” …. Thank Goodness that he kept handing those beautiful paintings to me to me! This is because people DO become the children of their environments. We become tone. In Suzuki Sensei’s words- “You Become tone.” (one of his highest praises). What kind of tone will we become? What kind of tone are we offering our student and children and the people who surround us? The start determines the destiny.